You know her life was saved by Rock 'n' Roll! It was alright, alright it was alright! Well, you know, it ain't gonna help me at all! And baby it feels alright, it was alright! Lou was a rock'n'roll animal, glam rocker, avant-gardist, human transformer, arty-farty artist, dreadful boring musician, brilliant innovator, banal lyricist, exhilarating songsmith, drug addict, clean health freak, inspirator for the Czechoslovak velvet revolution, grumpy old man, charming and caring of those who stood close to him. The list could go on forever... Best of all: he was completely unpredictable. He seldom made the career moves the record industry wanted him to do. 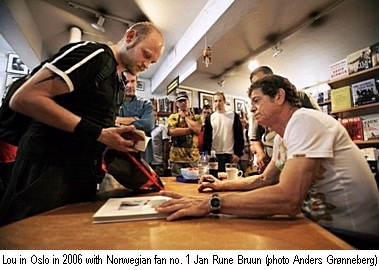 I met him swiftly once, lining up in a long queue in a bookstore in downtown Oslo. He was not in the best of moods, but signed the booklet of my Velvet Underground box in addition to the expensive book of his mediocre New York photos I had to buy to obtain it. But it was well worth the price, and the wait. Lou was never able to surpass what he and the rest of the Velvets achieved with the debut album The Velvet Underground & Nico. But hell, no one could. It was and is the best rock'n'roll album of this world!